Bridgewater, NJ- The Long Island Ducks (2-1) defeated the Somerset Patriots (1-2) 6-1 before an Atlantic League playoff record 8,131 fans at TD Bank Ballpark in Game Three of the Liberty Division Series. With the win, the Ducks have taken a 2-1 lead in the best-of-five series. The Ducks jumped out to a 3-0 lead in the top of the first inning on RBI base hits by Lew Ford and Marc Krauss, followed by an RBI fielder’s choice by Angelo Songco. Long Island extended the lead with two more runs in the top of the sixth inning on an RBI single by Dan Lyons and an RBI double by Giovanny Alonzo that made the score 5-0. A solo home run by Anthony Vega (1) in the top of the eighth inning gave the Ducks a 6-0 advantage. The Patriots lone run came on an RBI double in the bottom of the ninth inning by David Vidal that just missed clearing the fence for the 6-1 final. Jake Fisher (1-0) picked up the complete game win, allowing a run on six hits and nine strikeouts. Will Oliver (0-1) suffered the loss, allowing five earned runs on ten hits in six innings pitched. “We seemed to have a couple good at bats against Fisher. We just never could seem to push anything across and really didn’t threaten often. He did a great job. I really can’t take anything away from him,” Jodie added. 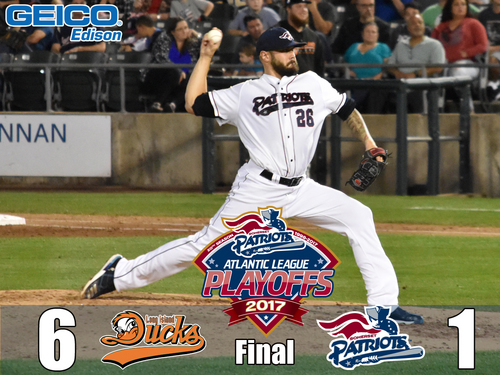 The Liberty Division Series continues at TD Bank Ballpark on Saturday evening with Game 4 at 7:05 pm. Pitching Probables are Ducks RHP Jake Dunning (2-3, 3.64 ERA) vs. Patriots RHP Patrick Johnson (2-2, 4.76 ERA). For tickets, visit www.somersetpatriots.com.